Vanessa’s newest cover of “Little Bit Of Rain” is now available to buy/stream on your favorite digital retailer HERE. Stay tuned for next month’s cover! Watch Vanessa’s Official Video For “Little Bit Of Rain”! In case you missed it on Wednesday, take a look at the exclusive Consequence of Sound premiere HERE, featuring 10 things Vanessa loves about Neil Young. 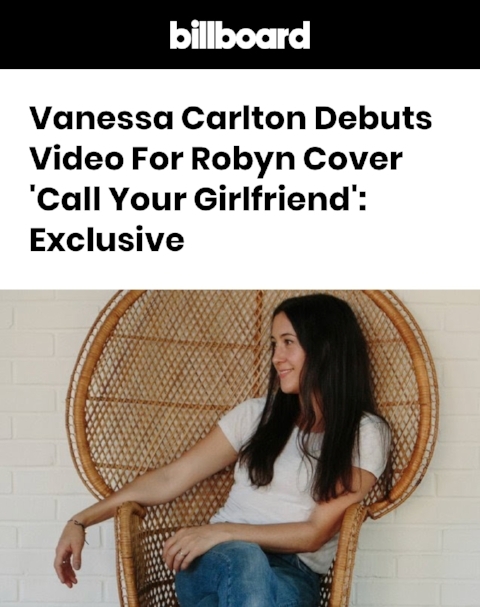 Be the first to see Vanessa Carlton's official video for her newest cover “Call Your Girlfriend” (originally by Robyn) with the official premiere by Billboard HERE! See what Vanessa had to say about the video below! "I found Patrick McPheron, the director, on YouTube! I was immediately struck by his musicality and his eery aesthetic. I love it when you come across a video that is so compelling that you have to watch it until the end. How rare! I reached out to McPheron through instagram (@interiorstate) and asked him if he wanted to do a few videos for me. This is one of a couple. I love the juxtaposition of this video....how prim and proper these couples are set against a song about betrayal. It’s very Patrick." This September, Vanessa will be performing at KAABOO | DEL MAR, a festival in Del Mar, California. Passes to the festival are on sale now, and you can get yours HERE. You can check out the audio on youtube HERE and buy/stream from your favorite outlet HERE. We are happy to announce a new show for Vanessa’s 2017 tour, this time in St Louis on March 31st. With this announce, the tour is 100% complete and no additional dates will be added. Tickets for St Louis are on sale now via Vanessa’s Fan Ticketing Page (VFTP) for a reduced service fee. Everyone who purchases tickets via VFTP will automatically be entered to win meet & greet tickets in select markets. Additionally, with the purchase of a ticket from the VFTP you can add a copy of Earlier Things Live and/or Liberman Live to your order for additional savings (this CD will be picked up at the merch stand on the night of your show - please bring your purchase confirmation with you). Additionally, after some delay, tickets are FINALLY on sale for Vanessa’s Largo show in Los Angeles, CA. Earlier Things Live Available for Pre-Order Today! Feb 24 - City Winery - Chicago, IL - SOLD OUT! Get your tickets directly from Vanessa’s fan ticketing page HERE for a reduced service fee! Everyone who purchases tickets via Vanessa’s Fan Ticketing Page (VFTP) will automatically be entered to win meet & greet tickets in select markets. Additionally, with the purchase of a pre-sale ticket from the VFTP you can add a copy of Earlier Things Live and/or Liberman Live to your order for additional savings (this CD will be picked up at the merch stand on the night of your show - please bring your purchase confirmation with you). Vanessa Announces 3rd Leg of 2017 Tour! We are excited to announce that Vanessa and her special guest Tristen will be continuing their 2017 tour with a third leg of shows, kicking off on March 30th in Louisville, KY! Although some last minute dates may be added, this will be the third and final leg of Vanessa’s 2017 tour, so don’t miss your chance to see her! Get your tickets directly from Vanessa’s fan ticketing page HERE for a reduced service fee! Everyone who purchases tickets via Vanessa’s Fan Ticketing Page (VFTP) will automatically be entered to win meet & greet tickets in select markets. Additionally, with the purchase of a pre-sale ticket from the VFTP you can add an autographed copy of Liberman Live to your order for additional savings (this CD will be picked up at the merch stand on the night of your show - please bring your purchase confirmation with you). Order a physical copy of Liberman Live through Vanessa's Online Webstore. Or you can purchase / stream the album from the retailer of your choice here. Vanessa Announces 2nd Leg of 2017 Tour! We are excited to announce that Vanessa and her special guest Tristen will be continuing their 2017 tour with a second leg of shows, kicking off on March 16th in Arlington, VA! Get your tickets directly from Vanessa’s fan ticketing page HERE for a reduced service fee! Everyone who purchases tickets via Vanessa’s Fan Ticketing Page (VFTP) will automatically be entered to win meet & greet tickets in select markets. Additionally, with the purchase of a pre-sale ticket from the VFTP you can add an autographed copy of Liberman Live to your order for additional savings (this CD will be picked up at the merch stand on the night of your show - please bring your purchase confirmation with you). We’ll be announcing a 3rd and final leg shortly after the New Year, so don’t worry if your city is not listed here. Vanessa Announces 2017 North American Tour! We are thrilled to announce that Vanessa and her special guest Tristen, will be hitting the road in 2017 with a tour of North America kicking off on February 22! Get your special pre-sale tickets directly from Vanessa’s fan ticketing page HERE for a reduced service fee! Everyone who purchases tickets via Vanessa’s Fan Ticketing Page (VFTP) will automatically be entered to win meet & greet tickets in select markets. Additionally, with the purchase of a pre-sale ticket from the VFTP you can add an autographed copy of Liberman Live to your order for additional savings (this CD will be picked up at the merch stand on the night of your show - please bring your purchase confirmation with you). This tour will bring to life the music from her newly released live album, Liberman Live. The first leg will begin in Indianapolis, IN and end in Richmond, VA, spanning much of the midwest and east coast. We’ll be announcing additional shows over the coming weeks and months, so do not worry if you don’t see your city listed here, as it may be in one of the future announcements. Order a physical copy of Liberman Live through Vanessa's Online Webstore. Or you can purchase / stream the album from the retailer of your choice here. And for those of you that missed them, you can hear a little about the live album by watching Vanessa’s album Q&A’s here -- Q&A 1, Q&A 2. Liberman Live Released Everywhere Today! Vanessa has followed up her latest album Liberman with a live edition! Liberman Live is Vanessa's first ever live album and is available globally TODAY, October 21st, 2016. You can order a physical copy of Liberman Live through Vanessa's Online Webstore. Or you can purchase / stream the album from the retailer of your choice here. New Videos on Vanessa's YouTube! Additionally, this week Vanessa posted several videos in support of the new album. The first of which is a live video for the album single, "River (Live)". She aslo posted two Q&A videos, Part 1 and Part 2, in which Vanessa speak about the impetus behind recording Liberman Live. Stay tuned for news about 2017 touring coming soon! Liberman Live Autographed Pre-Order Starts Now! Vanessa has followed up her latest album Liberman with a live edition! Liberman Live will be released everywhere via Dine Alone Records / Caroline International on October 21st, 2016. You can pre-order a physical copy of Liberman Live through Vanessa's Online Webstore NOW. Act quickly, only the first 60 copies ordered will be autographed by Vanessa! Look for additional announcements in the coming weeks! Liberman Available Today in UK & Europe! Vanessa's newest album Liberman is available in the UK & Europe today via Dine Alone Records / Caroline International. You can order your physical copy of Liberman - either standard, deluxe, vinyl or casette - through Vanessa's Online Webstore. Or grab a digital copy of the Deluxe Album or Standard Album on iTunes! Video for "House of Seven Swords" (Live in Nashville) Available Now! The live video of "House of Seven Swords," filmed in Nashville during Vanessa's last North American tour, is out now! Watch it on Vanessa's YouTube channel! UK & European Tour Begins Next Week! Vanessa is heading back to the UK and Europe on her tour in support of Liberman. It will be her first time touring in the UK and Europe in a VERY long time! The shows kick off on Tuesday, May 3rd in London with a sold out show! See below for the rest of the dates, and be sure to get your tickets now. "Nothing Where Something Used To Be (Steve Osborne Remix)" Single Out Now! Thank you to Clash for premiering the video of "Nothing Where Something Used To Be (Steve Osborne Remix)" yesterday! You can now watch the video on Vanessa's YouTube here. The remix is available as a new single today for download on iTunes or for streaming on all major outlets! This is an interesting remix situation cause this version of the song was actually the first version. Steve and I experimented a lot while we were exploring the palette of what Liberman should be. We looked at this as an experiment and when we moved on to the next chunk of songs this version didn't fit on the album. I was doing my dance workout one day a couple months ago and this version of the song was way deep on a playlist and popped up. I really loved it but had forgotten about this attempt. I sent the song to my manager and he was like we gotta release this! So here we are. I asked my friend Colin Devin Moore to create a visual for it and he came up with this video concept. I basically sang into a camera one morning on tour and he created what you see here. I love the attention to detail in the video. And the edit is really beautiful and perfectly links with arrangement of the song. This is a world I like to dip into every now and then. Liberman UK/EU Release Date & UK/EU Tour Announced! Vanessa's newest album Liberman will be released in the UK & Europe on April 29th via Dine Alone Records / Caroline International. The Liberman Deluxe edition will be available for pre-order on iTunes beginning February 12th, and each iTunes pre-order will include instant downloads of the following songs: "Matter of Time", "Operator", "Willows", and "House of Seven Swords"! Vanessa is heading back to the UK and Europe on her tour in support of Liberman. It will be her first time touring in the UK and Europe in a VERY long time! The shows kick off on May 3rd in London with more dates to be announced. Keep an eye on Vanessa's Facebook, Twitter, and Instagram for additional date announcements! All dates below are on-sale now except London, which goes on fan pre-sale for 48-hours beginning on Wednesday, February 10th at 10am GMT with the general on-sale starting on Friday, February 12th at 10am GMT . Get your tickets now as these shows should sell out quickly. Q Magazine Premieres Video Of "Matter Of Time" Live in Nashville! A big thank you to Q Magazine for premiering the live video of "Matter of Time"! The video was filmed in Nashville during Vanessa's last North American tour. Watch it here! "House of Seven Swords" Video Premiere on WSJ Speakeasy! Thrilled to share that WSJ Speakeasy has premiered Vanessa Carlton's new video for her song "House of Seven Swords" that appears on Liberman - out now! CLICK HERE to check out the video and read about her inspiration for the song.